Record Mortgage Refinancing - The Next Sound You Hear May Be "Pop!" With average incomes in the U.S. generally remaining flat, simple math says when mortgage rates get high enough, the market will have to correct. And as rates go up, you might also expect mortgage refinancing activity to go down. 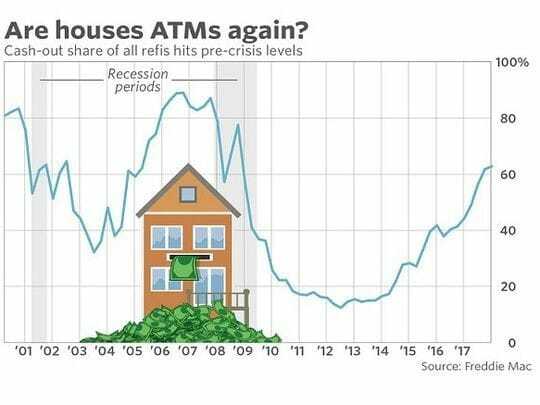 But it isn’t, it’s going up fast, which means homes are turning into ATMs again (see chart). Believe it or not, cash-out refis now represent a whopping 36% of total mortgage applications. And borrowers are not refinancing to get a “lower rate,” but instead to get cash out from the equity in their home to pay for living expenses and to pay down higher interest consumer debt. They may claim they’re making home improvements, but many simply need the money to maintain their current lifestyle. The last time this happened, in 2008, an epic financial catastrophe, related bailouts, and a host of broken promises all happened. Mortgage rates may still be near 30-year lows, but they’re on a fast rise towards 6%. They’re currently sitting at 4.86% according to the Mortgage Bankers Association. That’s the highest rate since 2011. But once the 30-year rate gets over 6%, combined with surging home prices, homeowners budgets will be squeezed even tighter than in 2008. Then, homeowners are likely to start making the kind of decisions that can force a housing bubble to pop. Home prices might be temporarily propped up by buyers trying to close deals before mortgage payments get too expensive. But then home prices could crash even harder if this leads more homeowners to foreclose on homes they can’t afford. There were over 3 million foreclosures filed in 2008 alone. That same crisis caused home prices to plummet 21% in the same year. And that was just one year. The housing crisis continued into 2011. 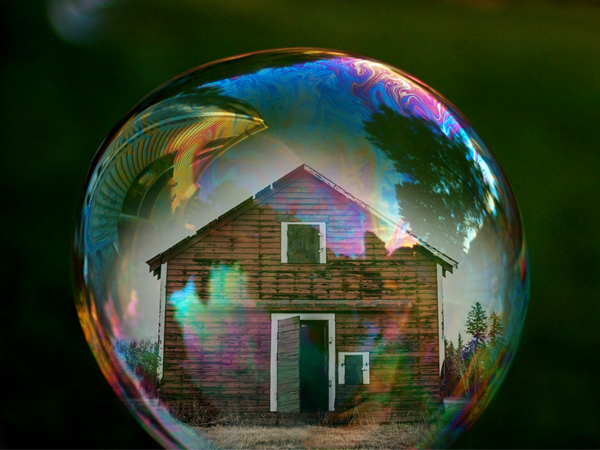 If another housing bubble does implode, recovering from that crisis might be challenging. One reason has to do with banks that are unprepared. “Undue disruption” would be when banks stop lending. That’s when credit freezes up in a credit-dependent economy. Everything comes to a halt. Paychecks start bouncing. Translation: This is what we don’t want to happen, especially during a housing crisis. But it sure seems to be getting ready to happen. 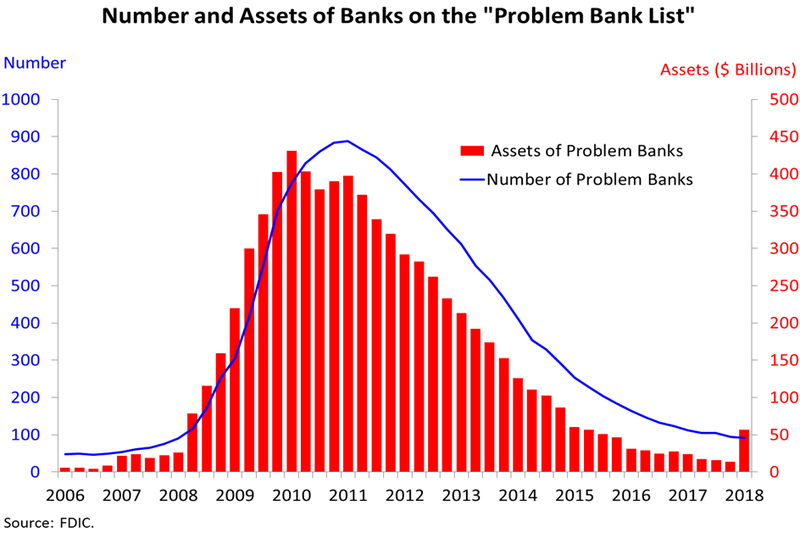 And this time bailouts, Quantitative Easing, and other remedies economists tried between 2008 and 2012 to ease a mortgage crisis might not work as well, if at all. Bottom line is that banks are unprepared and buried in lawsuits. Consumers are buried in non-mortgage debt. Corporations will simply make every effort to shift the risk elsewhere. These are interesting times indeed. The impending housing bubble, and a looming market correction will both reveal just how similar the “script” is to 2008. Until then, you may want to start hedging your bets. Find an asset that is known to be a source of protection during times of economic disruption, such as gold and other precious metals. There may never be a better time to protect your wealth than right now.